People fill containers with water from a broken pipe in Caracas on March 12. 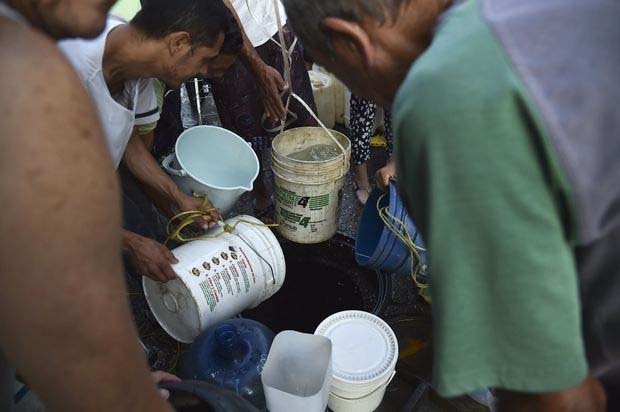 Residents of Caracas are standing in long lines waiting to fill drums with water as a national power crisis stretches into a fourth week, keeping vital pumps from reservoirs off line and exacerbating a deepening shortage in the Venezuelan capital amid a drought. Dozens slept in line for their turn at a well near Petare, the city's biggest slum. Three men hurled an old paint bucket tied with ropes down a well hoping to hit water. Cars parked by the nearby Cota Mil highway waited for their turn to place bottles under small streams that run down the Avila mountain. In one of the city's main parks, residents took turns tapping hoses meant to water the plants while their children played nearby. Even in the city's most affluent neighborhoods, residents filled tubs from their ground floor pools to flush their toilets. People draw water from a sewer to be used in their toilets, in the municipality of El Valle in Caracas on April 1. Since a week-long blackout that began on March 7, power service has been intermittent at best throughout Venezuela as the government points fingers at supposed sabotage and attacks on the grid while ignoring accusations of mismanagement and incompetence. Protests have flared in recent days as Venezuelans grow tired of the collapse in public services from water to power and Internet and phone service. The lights were off more during the month of March than they were on. 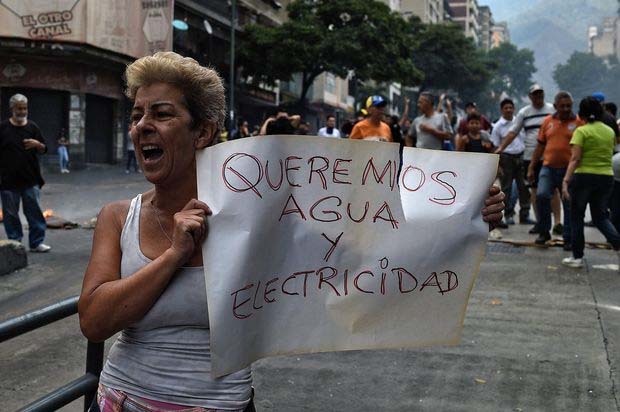 A woman protests the lack of water and electric service in Caracas on March 31. President Nicolas Maduro announced 30 days of power rationing in a televised address on Sunday evening though didn't provide details on how the rolling blackouts will be implemented. Caracas, 900 meters (2,950 feet) above sea level, gets its water from the Tuy system of reservoirs and pumping stations below, which requires a minimum of 600 megawatts to operate. When the city has tried to pump water up to its 5.5 million residents in the past week, it's failed, Marrero said. “We haven't had running water at home for fifteen days,” said Susana Bruno, a cashier at a supermarket collecting water with her husband and son at police module near a main highway. "The water service has been intermittent for years, but we at least had service four days a week. We've never been through something like this before." The water system has been hanging by a thread for months. The military, which enjoys many economic franchises granted by Maduro, lords over the supply, cornering a lucrative trade and selling truck loads to those who can pay for it. A drought during the seasonal dry season has worsened the water situation, driving the price up even more. While weeks of power cuts have increased the political instability in Venezuela, it's also distracted many from supporting efforts by National Assembly head Juan Guaido to lead organized street protests aimed at ousting Maduro. With constant telecommunications failures Guaido's messages via Twitter or streaming service are heard abroad but not always at home. The political standoff is likely to be prolonged and there is growing popular frustration that Guaido has been unable to force change amid a worsening crisis and tighter U.S. sanctions, Eurasia analyst Risa Grais-Targow said in a March 29 note. "The ongoing power crisis is sapping some of Guaido's momentum as individuals shift their attention back to their daily survival," Grais-Targow said. “But structural factors still point to eventual regime change,” including the failure to provide basic services. Story by Fabiola Zerpa and Patricia Laya from Bloomberg.